The Toyota Paseo (known as the Cynos in Japan and other regions) is a sports styled compact car sold from 1991–1999 and was loosely based on the Tercel. It was available as a coupe and in later models as a convertible. 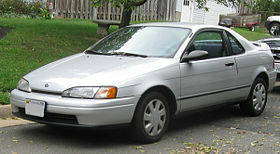 Toyota stopped selling the car in the United States in 1997, however the car continued to be sold in Canada, Europe, and Japan until 1999, but had no direct replacement. The Paseo, like the Tercel, shares a platform with the Starlet. Several parts are interchangeable between the three.